The anti-heroine is a rare breed: in books, as in life, women get away with less than men. Few contemporary authors flaunt this convention more than the British crime novelist Anthea Cohen, creator of the nurse-heroine Agnes Carmichael. Between 1982 and 2005, Cohen wrote eighteen novels about Agnes, all but one of which have the word “angel” in the title. Agnes, when the reader first meets her, is plain, awkward, spiky; a martinet of a nurse, and a friendless, charmless woman in her personal life, if she can be said to have a personal life at all. Eventually, the reader learns that Agnes was a foundling raised in an orphanage, which accounts for some of her insecurity and difficulty connecting to others. Completely rootless, all she has is her career. I first discovered the Agnes Carmichael novels in high school. I’ve always been drawn to lesser-known, forgotten authors, because I love nothing more than an underdog, and I’ve always read more women writers than men. I picked up Cohen’s first novel, Angel Without Mercy, perhaps mainly because I knew it featured a gay couple, and, as a lonely gay teenager, I grasped at anything with queer characters. The gay couple was there, but what kept me reading was Agnes herself. I had literally no friends for most of high school, and I almost never saw that raw loneliness reflected in fiction. I wasn’t as prickly as Agnes, but her predicament still spoke to me on a profound level. In Agnes there is no charm, no warmth, nary a glimmer of a winning personality. Yet none of that prepares the reader for what comes in the climax of the first novel: Agnes commits murder, and gets away with it, setting the stage for seventeen more novels of homicidal adventure. In every novel Agnes commits at least one murder, sometimes more. She adores animals, and so her greatest wrath is reserved for those who abuse animals. She also kills to protect children from abuse, though she detests children. She also kills rapists, drug dealers, blackmailers, tyrannical parents… the list goes on. No one Agnes judges to be an evildoer is safe. In one particularly byzantine novel, Agnes befriends a young couple who are very in love and then learns that they are, unbeknownst to each other, brother and sister; she kills a blackmailer threatening to expose this fact, so that the young man and woman can stay together and never know their true relationship. This makes for a strange, troubled landscape, yet the novels are eminently readable, thanks to Cohen’s smooth, elegant prose and inventive plots. As I read more of her books, Cohen ensnared me in her web and soon, Agnes’s brand of justice began to make sense. One of Agnes’s go-to arguments is that the justice system is never hard enough on people who abuse animals or children. I detest the death penalty, yet, hypnotized by Cohen, I found myself accepting that of course Agnes had to kill these people, because otherwise they’d get off with a slap on the wrist and continue their wrongdoing. What Cohen taps into is an atavistic need for eye-for-eye justice. I’ll freely admit that somewhere deep inside me lurks an unflattering desire to see “bad” people truly suffer, and Cohen’s novels sate that desire, sanitized through the prism of fiction. Courts, fines, prison time: it’s all well and good in a civilized society, but isn’t it somehow more satisfying to see someone who purposely ran over a cat, or slit a horse’s neck, or hit a toddler until she bruised, punished in a much more visceral way? “Prison is too good for them!” — I’ve encountered that phrase in old-timey novels, and perhaps it resonates more than I’d like. 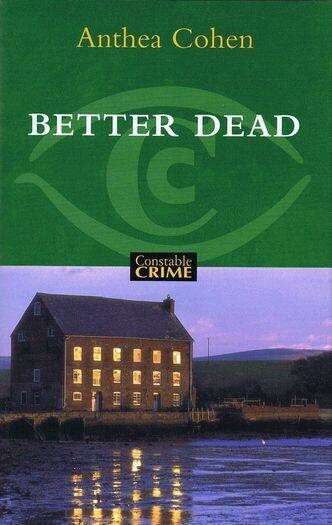 The final novel in the series, the only one that doesn’t have the word “angel” in the title, is simply called Better Dead, which is a perfect summation of Agnes’s philosophy: some people are better dead. So, in a twisted way that makes sense within the universe of the novel, the prickly Agnes is putting the world to rights, one abuser at a time. And Agnes does have her own peculiar morality: she won’t kill unless she has definitive proof of a person’s culpability. As a more likable, caring side of Agnes emerges, she befriends the friendless and vulnerable, nurses sick animals back to health, looks after lonely old ladies, and it becomes clear that she sees herself as a protector of the vulnerable. Agnes also abhors racism. So while the “angel” of the titles is obviously ironic, to herself — and to some extent to me, the ever-biddable reader, putty in Cohen’s hands — Agnes does become an angel of a kind. It’s rare to encounter a woman protagonist who is entirely without charm, and Agnes has no charm whatsoever. She is at first gauche, and then, in the later novels when she has become confident and financially secure, coolly composed. Though she is often kind, she is emphatically not warm. Nothing about Agnes fits society’s notions of what a woman should be, in fiction or in life, and yet she won not only my respect, but eventually my affection. The respect comes from her doling out justice, but the affection arises from a subtler source. There’s more to the appeal of Agnes and Cohen’s novels than the visceral justice. Agnes is an eternal misfit, and I, having so often felt like a misfit, can’t help but cheer at Agnes’s power and agency, her ability to shape events. And she helps the vulnerable, and god knows I’ve felt vulnerable. I’m most afraid that someone will hurt me when I’m at my lowest, and I think I’d be secretly grateful for a guardian angel like Agnes, homicidal or not. I read many of Cohen’s novels when I was deeply depressed. Sad, broken, neurotic characters abound in Cohen’s novels, many of them explicitly mentally ill, and Agnes usually becomes a champion and confidante to them. By the time I rediscovered Cohen’s books, then in college, I had been depressed for months, and I felt pretty broken myself. Few of the books I’ve read dealt with depression and fragility, and Agnes’s universe resonated deeply. Agnes is always drawn to the vulnerable, whereas in so many novels and films, not to mention in life, people are only pitying towards or repulsed by vulnerability. One novel opens with Agnes rescuing hens from an inhumane factory farm and nursing them back to health and comfort; there is an aspect of healing in these odd books. This is what separates Cohen’s novels from other stories featuring (usually male) vigilantes: Cohen’s novels are ultimately not about toughness and roguishness but about vulnerability, about human fragility. Behind all the murder, there is a keen, if dark, empathy at work.